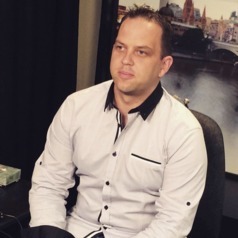 Dr Marc C-Scott is a senior lecturer in Screen Media at Victoria University. He completed his PhD "Invention to Institution: A Comparative Historical Analysis of Television across Three National Sites” in 2016. Marc has taught at many higher education institutions in the areas of video production, motion graphics, visual effects, online media and cross-media practice. Marc has written numerous articles for The Conversation along with both local and international television and radio interviews. His research interests are within television (history, institutions, policy, broadcast technologies and methods), cross-platform media, sportscasting and the use of new media platforms and distribution methods. Marc is the host of the Media Mayhem podcast (mediamayhempodcast.com), which discusses television, streaming, online video, and more broadly about the mayhem that is the media industry.